A convection oven can save you time and energy in the kitchen but there's a bit of a learning curve if you're using one for the first time. Follow these tips for successful convection cooking. 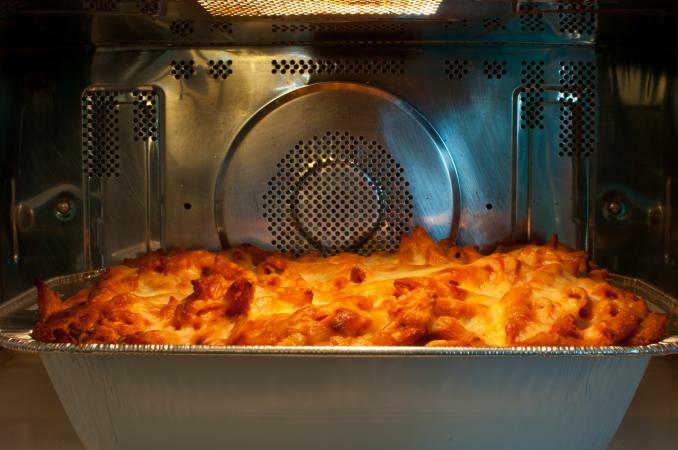 It's important to know how convection ovens cook food. A conventional oven uses radiant heat that comes from under and over the food from the top and bottom of the oven. On the other hand, a convection oven blows hot air over and around food. All that hot air surrounding the food helps it cook evenly and more quickly than can be achieved by conventional methods. Convection ovens can be gas and electric; there are electric countertop models as well. Using the convection oven properly will ensure that your cooking and baking endeavors turn out perfectly. In general, decrease a recipe's conventional oven temperature by 25 degrees F and/or shorten the time by 15 to 30 percent, depending on the item. For example, if a recipe for a beef roast calls for cooking at 350 degrees F for 2 hours in a regular oven, in a perfect convection world, it would be cooked at 325 degrees F (25 degrees lower) for 84 minutes (30 percent less time). Reduce the cooking time for dishes like casseroles, vegetables, and baked goods by 15 percent. As always, use an instant-read thermometer to check for doneness. Since a convection oven cooks food by blowing hot air on it, you don't want to let anything get in its way. That means using low-rimmed pans to cook items that will give off fat and juices, making sure the food doesn't touch the sides of the baking pan, and allowing at least 2 inches of space on all sides between the pan and the oven. For cookies and other items that will give off limited fat or juices, use unrimmed pans. Any cookware can be used in convection ovens as long as there is room for air to circulate around the pans. One of the benefits of convection is that it crisps the outside of foods in much the same way cast iron does. As always, however, check with the manufacturer of your cookware to make sure it can be used in a convection oven. Never cover the oven shelf with aluminum foil or another product because it will prevent the air from circulating freely. If you use parchment paper on your baking pans, the corners will need to be anchored down with pie weights or another method. Otherwise, the blowing air of a convection oven will lift it up and over the food, possibly ruining the appearance and preventing browning. 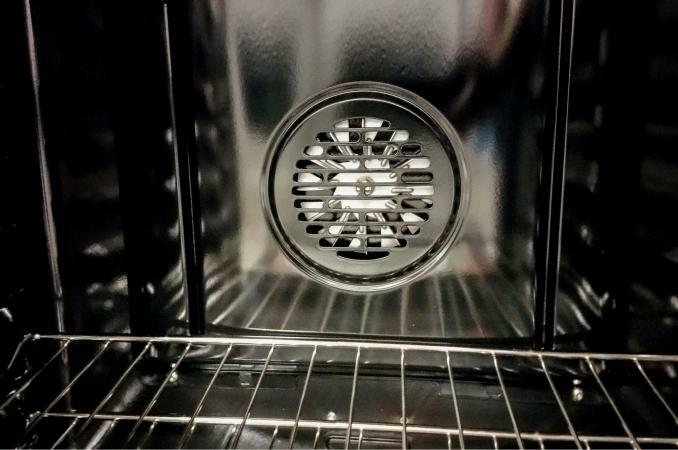 Most convection ovens can be used with the fan blower turned off, essentially turning it into a conventional oven. Some models also offer different levels of air, and instruct when to switch from High Air to Low Air and which items cook best under those conditions. Spend some time reading the manual that comes with your particular oven to ensure that you understand exactly how it works. Braising: When you are cooking low, slow, and covered, a convection oven is a good choice because it can cut the time considerably. Roasting: Roasts, turkey, and vegetables will cook faster and more evenly in a convection oven. Additionally, the hot air will crisp and caramelize the skin creating a seal to keep the juices in. Certain baked goods: Since foods cook evenly in convection ovens, recipe instructions that call for rotating pans and switching levels can be ignored. Fat-based recipes like pie crusts and biscuits that depend on steam to make them flaky will do well in convection ovens. Dehydrating foods: Convections ovens yield excellent results and take much less time when making fruit leather, oven-dried tomatoes, or just dehydrating foods in general. It's also great for roasting nuts and seeds and drying meringues. Puff pastries: This type of pastry relies on steam to puff it up but the hot air blowing on it will make it skew to one side instead of rising tall and straight. Soufflés: Delicate whipped egg whites are what make soufflés rise high. Any slight jarring motion, like a slamming oven door or hot blowing air, can deflate them in an instant. Cakes: Cakes like sponges, angel foods and chiffons that contain little or no fat need to be treated with kid gloves, not hot air which can impede their rising. Breads: The jury is still out on this, but most breads that rely on rising while baking won't do well in a convection oven because the crust can bake before the interior has risen fully. Breads intended to remain flat, like focaccia and non-yeasted crackers or lavash, do well in a convection oven. Just like a poker hand, knowing which foods cook well in your convection oven and which don't is key to a successful relationship with this timesaving kitchen device. Once you've passed the experimentation stage and have a firm grasp of those concepts, you should be well on your way to crisper, browner, more evenly cooked food in much less time.